The ‘low country’ cuisine of the Sea Islands is influenced by Gullah/Geechee traditions and history. The slaves brought brought from Africa to work on the rice plantations were often selected based on their knowledge and experience in rice cultivation. 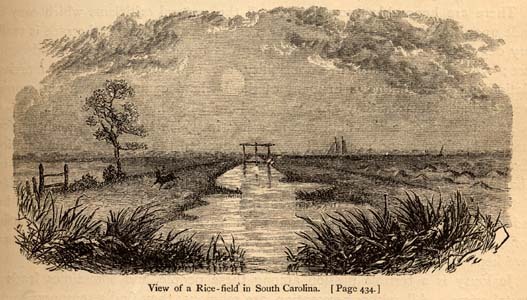 During the 1700s and up to the civil war, South Carolina was the country’s largest rice producer. Rice, therefore, is a main staple in the Gullah/Geechee cuisine, along with shellfish, fresh fish, and fresh vegetables. Ingredients in Gullah/Geechee cooking are strongly tied to the land, sea and seasons. Okra, field peas and collard greens make frequent appearances. One pot meals such as purloo, a dish comprised of rice, vegetables, shellfish and meat or sausage, would cook all day, and be ready after the day’s work was done. 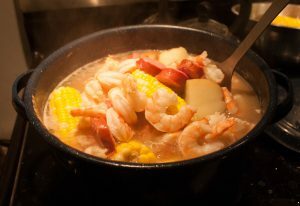 Other specialties include Frogmore Stew, from St. Helena Island, which is a mildly spiced shrimp or seafood boil containing corn on the cob, red potatoes and sausage or ham. Two other common ingredients include peanuts and benne seeds. Benne seeds are nothing other than sesame seeds. The seeds arrived in the low country and Sea Islands with the west African slaves and can be traced back to Madagascar. 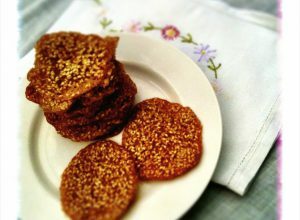 Benne is the Bantu word for sesame. Benne wafers are a common treat or souvenir at any market in the area and benne seeds are a staple of the cuisine. ‘Low country cuisine’ refers to the style of cooking found in South Carolina and down the Georgia coast. It is strongly tied to the ingredients and cooking methods of the Gullah/Geechee, who for hundreds of years cooked for the plantation owners and well to do city people. In cities such as Charleston, Beaufort and Savannah, common low country specialties include shrimp and grits, peanut stew, and ‘she crab’ soup. 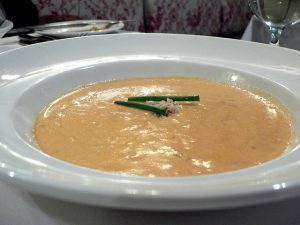 She crab soup contains the orange roe of the female crab which gives it it’s distinctive flavor and color along with dry sherry added as a finishing touch. There is a strong effort in place to preserve the rich heritage of the Gullah/Geechee. In the realm of food, however, it is more a matter of acknowledgement of the debt low country cooking has to the Gullah/Geechee. Attention in the last few years from celebrity chefs such as Anthony Bourdain, Paula Deen and Martha Stewart seem to indicate that the cuisine has an enduring place in the country’s food landscape. There are several cookbooks available specifically containing Gullah/Geechee recipes. The Gullah Seasoning at Dish.com, is for shrimp, fish and chicken and is credited to Gullah Cuisine, by Charlotte Jenkins and William Baldwin. 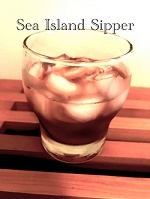 This month’s cocktail is the Sea Island Sipper. Its a super easy drink with just a couple ingredients blending bourbon, amaretto, lime, peach and cranberry flavors. Add all ingredients to an ice filled glass and stir.